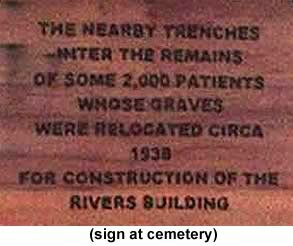 The graves were moved here from Rivers Complex in 1938. 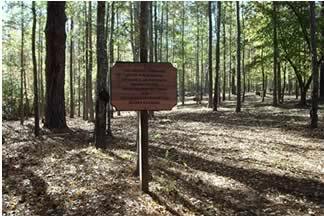 [To access this cemetery, gain permission from both Central State Hospital and the Men's State Prison.] From the Baldwin County Courthouse, go east on Hancock St. one block. Turn right (south) on Wayne St. Go straight on Wayne St. for one mile. Jog left onto Vinson Highway. Continue on Vinson Highway (Hwy 112) for 1.7 miles. Turn right on Laboratory Rd. and go 0.3 mile. Turn left on Bostick Rd and go 0.2 mile. Turn left on Lawrence Rd, gain permission to proceed past the Men's State Prison, and go less than 0.1 mile to where Lawrence Rd turns to the left and the Visitation Parking lot is on your right. (This lot is at the southwest corner of the medical unit of the prison.) Walk through the Visitation Parking lot to the driveway going out the other side. Walk for about 0.1 mile (past the small station on your right, over Camp Creek, and past the gate) to the sewer line. Continue straight up the hill past the sewer line, following a very faint roadbed which curves to the left. The cemetery covers the top of the hill before you. A monument marks the site. 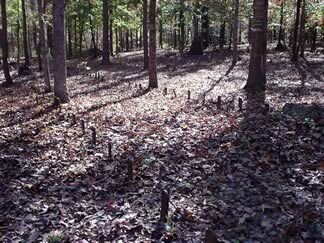 Approximately 2000 graves moved from the Rivers Building area in 1938, some marked with numbered iron posts.